Beautifully printed, sharp and clear, in 4 colors on heavy white poster board (This e-photo can't show the high quality printing). 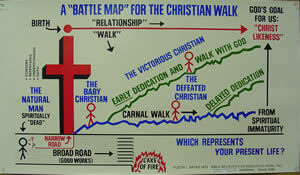 It's the same chart as in the pocket size, folded "Battle Map For The Christian Walk" tracts. Used in many churches for follow-up and Bible classes for both older and newer Christians... to show and teach the various aspects of the Christian Walk. The folded, pocket size Battle Map tracts are even more effective for Bible classes when used with this 22 x 38 inch Battle Map Poster.